Sam Wilkeson was a war correspondent for the New York Times who had sons in the Union army, including Lt. Bayard Wilkeson, an artillery officer who was mortally wounded on the first day at Gettysburg. The story of Bayard’s death became a northern sensation since he was one of the youngest artillery officers in the army, the son of a prominent journalist and also because he died in a particularly heroic fashion. 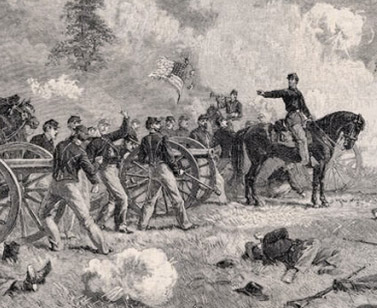 The young lieutenant covered the retreating forces from the Union XI Corps on the battle’s first day and reportedly had to amputate his own shattered leg when doctors were forced to flee in the face of the oncoming Confederates. The elder Wilkeson, who was married to Elizabeth Cady Stanton’s sister, recovered his mangled son’s body in Gettysburg’s aftermath and wrote an angry report in the Times which appeared on July 6. 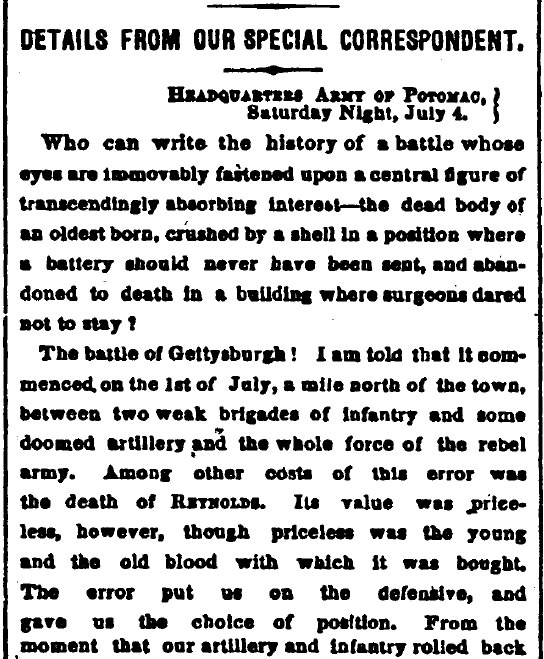 The article began: “Who can write the history of a battle whose eyes are immovably fastened upon a central figure of transcendingly absorbing interest –the dead body of an oldest born son, crushed by a shell in a position where a battery should never have been sent, and abandoned to death in a building where surgeons dared not to stay.” Unionists later redistributed the moving piece as a pamphlet under the title: Samuel Wilkeson’s Thrilling Word Picture Of Gettysburgh. Artist Alfred Waud also drew a famous sketch of the young Wilkeson directing his battery on the battlefield. The story remains one of the most compelling of the battle. You can read more about it here at a special blog site built by Civil War enthusiast Randy Chadwick. Also, Louis M. Starr’s Bohemian Brigade: Civil War Newsmen in Action (1954) provides good context and more detail about Sam Wilkeson, one of the nation’s first embedded war correspondents. A more recent study by Michael A. Dreese, Torn Families: Death and Kinship at the Battle of Gettysburg (2007), provides several descriptive pages (available through Google Books) as part of a fascinating chapter on fathers and sons during the war.